Most stations only go to ten. 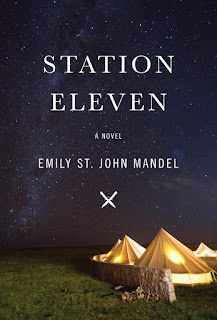 For the last convocation of Think Galactic, we discussed "Station Eleven" (2014) by Emily St. John Mendel. "Station Eleven" is, partially, a post-apocalyptic tale, of the survivors-making-do-in-the-aftermath variety. But it's written more from the tradition of what we were calling "high", "modern", or "literary" fiction, and has a lot of focus on art and memory, among other things. Definitely a good read, well-written, and we all rather liked it; we did, however, have some criticisms of the novel qua post-apocalypse. While there's nothing off-puttingly unrealistic about the world of "Station Eleven", those of us who have spent more time reading/watching/thinking about apocalyptic scenarios wound up pulling at loose threads pretty hard. surreal aspects of the book. We all liked the book, particularly a few of the strongly-written characters like Miranda & Arthur, Jeevan & Frank. John pointed out the fusion of high literary form with Star Trek references (Voyager, no less) and named the elephant in the room, and that elephant is named JOYCEAN. Also talked for a bit about "figuring out how to read this", which a few other people picked up on--the process of finding genre cues and figuring out the braided structure. Tanya pointed out some resonance with Atwood's dystopian trilogy (2003-2013) and structural similarity to Mitchell's "Cloud Atlas" (2004). She also pointed out the fairly flat/plain prose style, which works well here. Suggests that the apocalypse is a major plus in writing, as it satisfies a "craving for the end of all things". I also pointed out the braided nature--I was reminded of Zadie Smith's "White Teeth" (2000) but with disaster--and the way that the pre-apocalyptic storylines seem more real, more compelling. 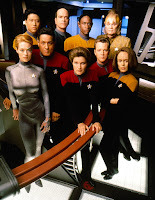 There's a fascination here for recurrence as a kind of stand-in for meaning or plot--someone else at the table phrased it nicely as "coincidence implies significance". I also had some nitpicky issues about the survivor's choices, and some food realism questions. Megan liked that it didn't focus on the usual post-apocalyptic suite (not super brutal violent), and that the core message(s) are about art, among other things. Characterized it as a "well, what now" post-apocalypse. Cameron had a lot of questions about the world-building, but noted that these weren't what the author was focused on. Brought up the theme of memory & immortality--even after the flu, characters such as Kirsten are aware and cautious of the way that their recorded actions will shape how they're remembered. Praised a few immersive scenes, and thought the word to best characterize the novel is "meditative". Sara shared the thought (and I may be over-paraphrasing here) that the novel really is all about the apocalypse, but the "apocalypses here and now" more than the flu pandemic: the way that traumas and disasters are happening to people all the time, but we figure out how to move on and survive if we can. She also pointed out that the "braid never really comes together into a ponytail"--there's not enough of a central plot or even concern to tie all the vignettes together. Gremlin really liked the "survival is insufficient" motto (which is the line from Voyager), and the question/theme of being awake and engaged versus sleepwalking--started us on the discussion of the search for meaning/identity/tribe as one of the main concerns here. Also dug Kirsten's troupe, particularly the musicians who are just known by their instrument/number now. We generally felt that there was a lack of authorial commitment to the post-flu world; none of the post-flu characters feel as compelling as Miranda, for instance. We wound up kind of mining the pre-flu sections/recollections to talk about themes and concerns--such as Clark's sort-of wake-up call re: believing in real personal change or not, in sleepwalking versus living an engaged & committed life. One of our critiques of the post-flu world is that the characters seem just as crippled by ennui & lack of goals as before; a few of us at the table thought that this aspect of "the modern condition" would be quickly eliminated by the hard work of survival, and the possibility of rebuilding a worthwhile society, in the post-apocalypse. A possible rebuttal is that everyone here is suffering from "Post-Apocalyptic Stress Disorder". Biological in nature and restricted to humans, the disaster here would have left vast swaths of infrastructure and material goods unscathed, lying around for the taking. While we appreciated the details of how long different kinds of fuels are good for, and that even highly-preserved food will eventually go bad, it still seems as though--for the tiny fraction of the world population that is left--that they should really be taking advantage of all the STUFF sitting around, instead of cowering in little rural areas. The idea that guns & ammo are any kind of rarity after a flu like this--in AMERICA, mind you--is pretty silly. Books! Where are the books. Even given the kind of hand-wavy "stay away from cities because" non-explanation, there will still be all kinds of materials sitting around, some of them fairly protected from the elements, for a long time. SOME OF THEM WILL CONTAIN USEFUL INFORMATION. Also, weirdo Tyler-later-Prophet kid who only gets to read one comic book and the New Testament because there's nothing else to read? AT AN AIRPORT? Much cultish violence could have been prevented by tossing some John Grisham novels and nigh-indestructable Cosmopolitan magazines at this kid. Particularly given the lack of raiding Walmarts/Home Depots/etc. going on, some of us found the worldbuilding re: self-sufficiency pretty weak here. It takes a lot of food to feed even a few dozen, much less a few hundred people for years. I'll grant that there are a lot of deer in Michigan, and the numbers would likely spike up even more with fewer humans/cars, but "venison" isn't quite enough to answer the food need here. There would need to be INTENSIVE hunting/gathering, or really extensive agricultural projects, to keep these people alive, and there's no evidence of either. It kind of felt like the flu selectively spared people with humanities degrees--just one or two engineer/scientist/mechanically-inclined folks could have had a hey-day here. Still all that coal/solar/wind/hydro-power potentials, for instance--really no reason to be electric-less. BUT! In the novel's defense, it's really not focused on the day-to-day of the post-flu societies, just a few sketches, and those mostly of the nomadic musician/actor troupe. 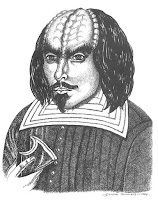 for not bringing up the original Klingon. Which I have now disqualified us for. Who led us into a brief aside on Shakespeare. There seems to be a kind of assumption that the reader base will be familiar with the bard; none of the plays are really foregrounded or discussed very much. We liked the discussion by the clarinetist that modern, post-flu plays really needed to be written and performed. And John expanded for a bit on some of the "Lear" here--particularly the "wren" line, and the way it reveals Arthur slipping to think of his adultery. But really it's hard to see "Lear" as meaningful to the novel other than as a reflection of Arthur (who dies just before the flu anyway). We really liked Station Eleven itself--Miranda's self-published comic book, a few copies of which survive to influence Kirsten & Tyler. I find something oddly compelling about in-fiction art, particularly comics, the way they allow dreams and fears and concerns to come out both blatantly and metaphorically, the way they're kind of a transparent microcosm of the very work you're reading. Reminded of the Escapist in Chabon's "The Amazing Adventures of Kavalier & Clay" (2000) and the painting in Tolkien's "Leaf by Niggle" (1945). John reckons that the fictional "Severn Airport" is more or less Muskegon. Think Galactic: "We Care About Maps!" Tanya pointed out that "you always die in the middle of a story", pre- or post-apocalypse. Also pointed out that this is kind of an "anti-Mad-Max" world, where people act with basic decency most of the time. 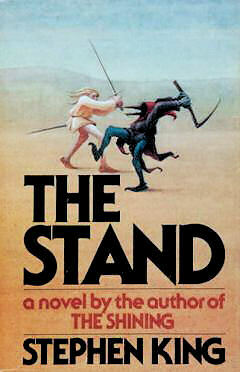 Unlike King's "The Stand" (1978)--the prophet here is an outlier. Edgar Pangborn's "Davy" (1964) was in my mind a lot as I read Station Eleven--mildly "cozy catastrophe" post-apocalypse, generally positive, concerned with the arts. Joyce, particularly "Dubliners" (1914) as the prime example of many stylistic elements here. Jon Krakauer's "Into Thin Air: A Personal Account of the Mt. Everest Disaster" (1997). "South", Ernest Shackleton's personal account of the Endurance Expedition, 1914-1917. Lois Lowry's "The Giver" (1993). Cormac McCarthy's "The Road" (2006), particularly as a non-genre-writer-apocalypse-that-non-genre-readers-will-read kind of comparison. Jack London's "To Build a Fire" (1902). To mentally escape the heat, I recently watched Powell's "Antarctica: A Year on the Ice" (2013); I brought up the interviews with people going a little crazy longing for specific foods. "Station Eleven" has a strangely poignant moment with Clark realizing he's eaten his last orange. A good discussion, and a well-written book. Also we somehow wound up discussing The Worst Cat, which you should check out. Just the worst. Think Galactic's next selection is "The Girl in the Road" by Monica Byrne.